She’s one giant spider…18,000lbs of spider, in fact. Standing 30-feet high, and on display in Ottawa, at The National Gallery of Canada. Made of bronze and steel, it is one of the largest sculptures in the world. It was created by French sculptor, Louise Bourgeois in 1999 when she was in her 80’s. (I had to let that sink in. She was in. her. ’80’s. when she created this. If I’ve read everything right, and I think I have – what an extraordinary feat.) And, it isn’t surprising to learn that many regard it as the culmination of her life’s work as an artist. Maman is the common French word for mother. And, pictured here, you can see that Maman carries a sac of 26 pure white marble eggs under her belly. It is said that the sculpture is an ode to Ms Bourgeois’ own mother, who restored tapestries in the family business. The spider represents the weaver, protector of her young, cleverness and strength. 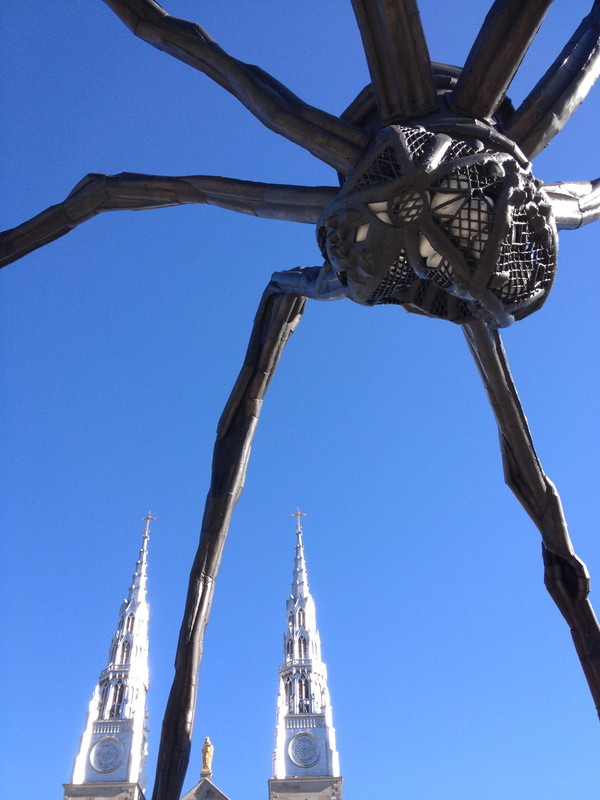 It was a brilliant blue-sky day in Ottawa when I first saw Maman earlier this month. Quite a setting for it. I was, at first, repelled by it. Then, astonished by it. And, now, in awe of its creator. ‘Maman’ – an incredibly striking piece. Needless to say. For more images of Maman, and further information about the sculptor, wander over here.